Add half the potatoes to a pot of cold water over medium heat. Cook for approx. 20 min. or until tender, then drain and set aside. Meanwhile, cut bread into cubes. Melt butter in a frying pan over medium heat. Add bread cubes, season with salt, and toast until brown, then set aside. In a clean towel set over a bowl, grate the remaining potatoes. Use the cloth to help you squeeze most of the moisture out of the grated potatoes, then transfer them to a clean bowl. Peel cooked potatoes with a small knife, discarding the peels. Press the potatoes into the bowl with a potato ricer. Add freshly grated nutmeg to taste and season with salt. Add egg yolks, potato starch, and mix well to combine. Bring a large pot of salted water to a simmer. 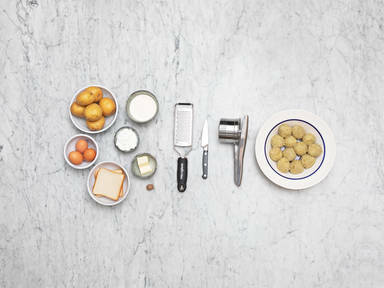 Scoop the potato mixture into dumplings and use your hands to fill each dumpling with some croutons, then roll into a ball. Transfer dumplings to the pot of simmering water and cook for approx. 10 min. Gently lift out with a slotted spoon and transfer to a serving dish. Enjoy!